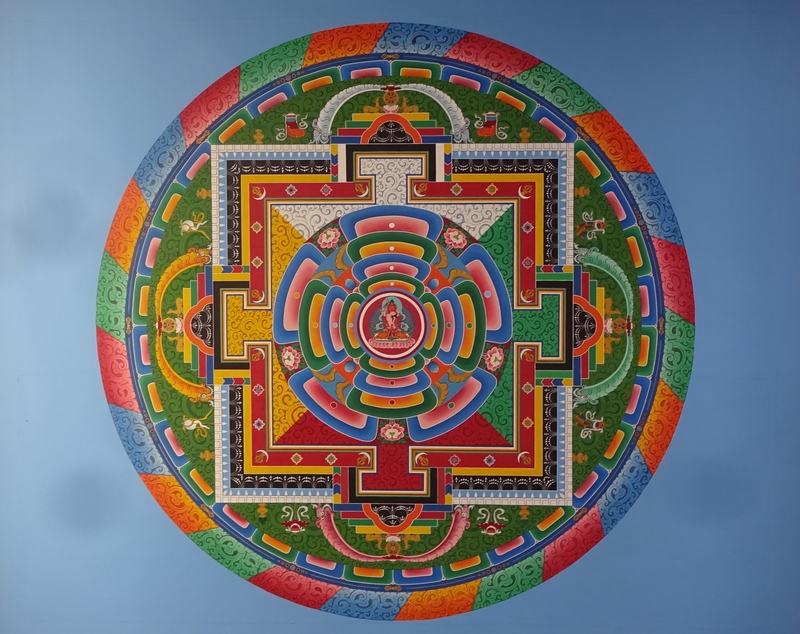 The plan to be in Crestone in the summer of 2015 was made the previous winter when registration opened for the regular two weeks of retreat with Tsoknyi Rinpoche. I had been attending two one-week back-to-back retreats with him each summer for several years. He has some land and an office there and comes once a year. The rest of the time he is in Nepal, Argentina, Mexico, Germany, England, now also Russia, and various other US locations (including east and west coasts). In any case, Crestone is a trip. Four hours south of Denver, it’s a small town at 8000 ft in the foothills on the western side of the Sangre de Cristo range. It’s not on the way to anywhere and it’s 50 miles from any commercial center. 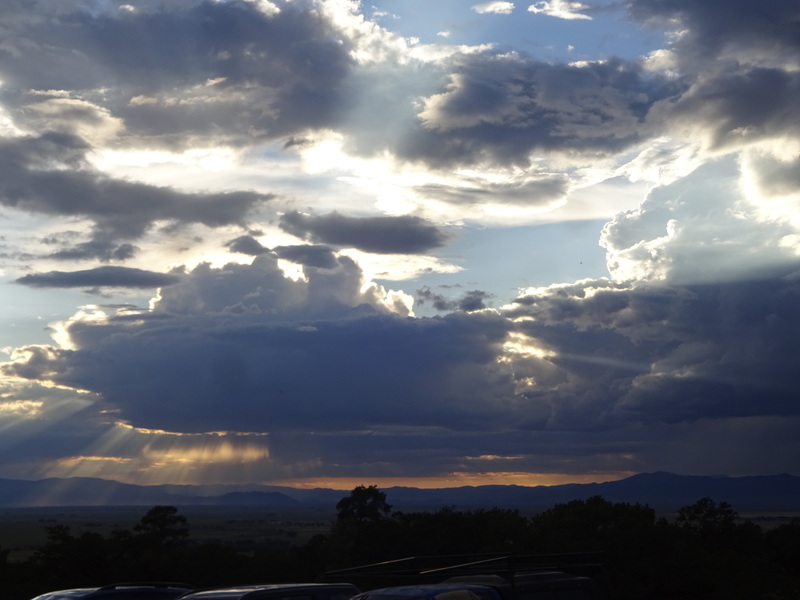 It has maybe two hundred people (seriously) in the unincorporated town and maybe 1000 more scattered across a few square miles of semi-developed (on and off-grid) residential subdivisions sprawling out on the flat scrub overlooking the expansive San Luis Valley. There are no less than two dozen operating spiritual and religious retreat centers there, mostly Buddhist (Tibetan and Zen) but also Carmelite nuns, a big Sri Aurobindo center, Episcopal, Baptist, New Age, etc. that provide a constant stream of visitors supporting the local economy–at least when there isn’t any snow. It turns out numerous very highly respected and well known Buddhist teachers have been to this land over the past 30-some years, blessing and buying land, opening centers, etc. Why? Because it looks like home, I suppose. One of these guys was the XVIth Karmapa, one of the most revered teachers of the 20th century and the head of the Kagyu order of Tibetan Buddhism, someone we might consider to be the CEO of Tibetan Buddhism. Although he died in a Chicago hospital in 1981 (and that’s quite a story in itself), a stupa was erected in his honour in Crestone in 1996 now standing on land supporting 3-year retreats by monks in training. It’s 5 miles out a single lane dirt road that gets progressively rough way up on a mountainside overlooking the immense valley below under a vast sky. The perpetual nature of that vast sky, regardless of temporary obscuration by clouds, is a major draw of this place. This unlimited, clear, open and changeless quality is a representation of what Buddhists regard as the true nature of mind, innate to all but accessible to only a very few, and no doubt a major reason for the selection of this site. 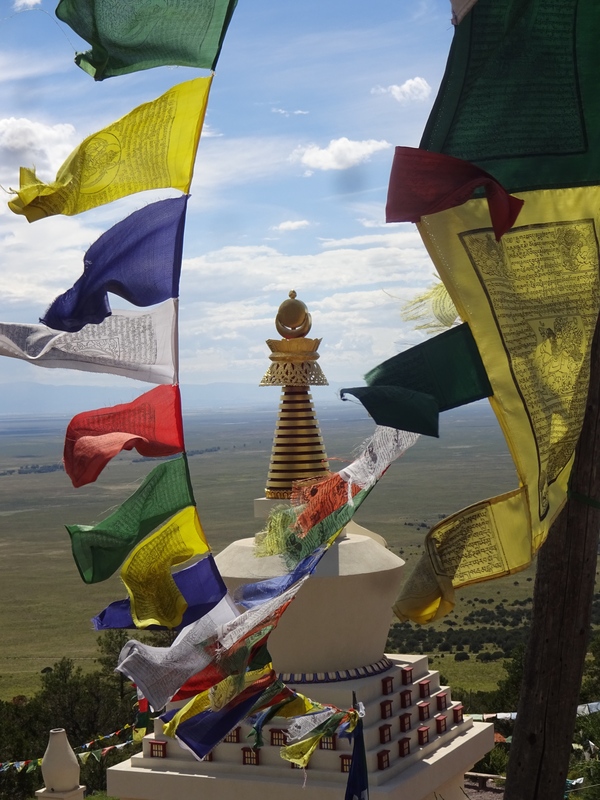 Though I had been to Crestone before, I visited that stupa for the first time during my visit in 2015. Buried inside the stupa are relics of some of the superstars of Tibetan Buddhism going back to Buddha himself: Padmasambhava, Marpa, Tilopa, Longchenpa, Milarepa, including also relics of more recent figures of the 20th century, Dilgo Kyentse, Kalu Rinpoche, Tulku Urgyen and Chogyam Trungpa. There are 100,000 hand-made miniature paper replicas of the stupa cached inside. It’s about 50 ft high and 25 ft wide at the base. Every structural detail is symbolic of some aspect of buddhism. I had never seen one so large in the United States. Upon visiting a stupa, the custom is to circumambulate in a clockwise direction while reciting one particular common (refuge) prayer. I took a few laps and then settled in front of the face, looking upward at the gold Buddha inset displaying the Apan mudra for purification and confidence. At that time, I could not have called myself a religious buddhist. I’m a student and practitioner of Atiyoga, Dzogchen. I am not dedicated to complex outer ritual; I am dedicated to internal transformative practices. I’ve also had a few extraordinary experiences. But there are also some complex and entirely foreign practices that go along with this tradition. When it starts to feel like organized religion, I generally head in the opposite direction. But as I stood there, all I can tell you is that I received an immediate and direct transmission of the collective devotion and accomplishment of every one of those teachers represented there. It was a massive hit– like 10,000 volts. Overwhelming–and it broke me open. I went to my knees for several minutes, absorbing the message of unwavering commitment, relentless discipline, the collected wisdom and the heart-opening fruition of ageless practice. The power of that moment will not likely recur, but it is surely embedded. It was one of those priceless boosts, both humbling and inspiring, that kicks up one’s own view and practice to another level and indelibly deepens one’s devotion and appreciation for the opportunity and benefit presented by these teachings. How one might interpret and hold an experience such as this is not something that reveals itself quickly. I regarded it as a confirmation that the attitudes we hold in pursuing our personal objectives must be fully explored, teased out and articulated if they are to be realized; that we must be impeccable in our behavior, reach beyond parochial interests and every ideology to an expanded vision that includes all. That’s certainly no easy task, especially in these times, with every district, state and region protecting their narrowly-defined interests; with fear and scarcity embedded and ritualistically evoked by the elected shamans who claim concern for the many as they act in the interests of the few. Nevertheless, it is good to be reminded that merely recapitulating the divided and divisive nature of every other issue will ultimately lead to a hollow victory. Our future actions will be increasingly limited by the consequences of our past actions unless we grasp and integrate better decision-making practices. We may not see the origins of what happens to us, but we can surely decide to be the origin of what happens by us. We all have an influence on the sustainability of life. We are the expression of a universal order in this moment. If we do not express it ourselves, something else will be imposed upon us. Nothing is nothing. And… everything is everything. Our biases bind and blind us; they are invisible but knowable harnesses that bridle us, becoming our principle references for reality. Loosening the bridle does not extinguish our bias, but it does widen our view. To listen for and sense the earth is to listen to our own heart. Listening to our own heart is the pathway to listening to another’s heart. All emergencies are the same emergency. How can we respond together to our common emergency? How will you respond to the call of the collected wisdom, unwavering commitment, sacrifice, risk and devotion of your teachers? 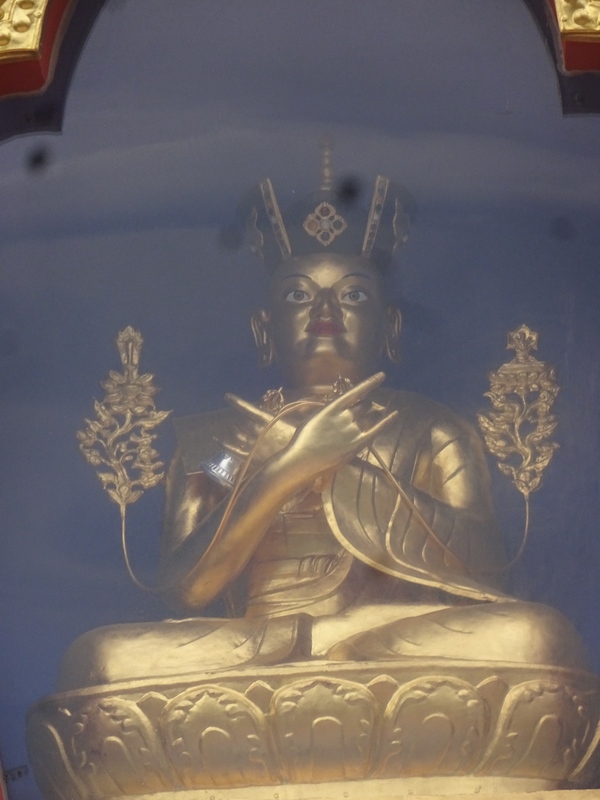 This entry was posted in Buddhism, Personal, Travel and tagged Apan mudra, Buddhism, CCL annual conference, crestone CO, Dzogchen, Dzogchen view, Karmapa stupa, San Luis valley, Tibetan buddhism, Tsoknyi Rinpoche, XVI Karmapa by garyhorvitz. Bookmark the permalink.